Since the old days, trams in St Petersburg have always been an efficient and cheap way to get around the city for most Petersburg residents and foreigners living and studying here. Typical trams running in St Petersburg Russia. Saint Petersburg is also known as Russia's cultural capital, the Northern capital of Russia, the Northern Palmyra, the Venice of the North... but once you might also have called it the Capital of Trams. 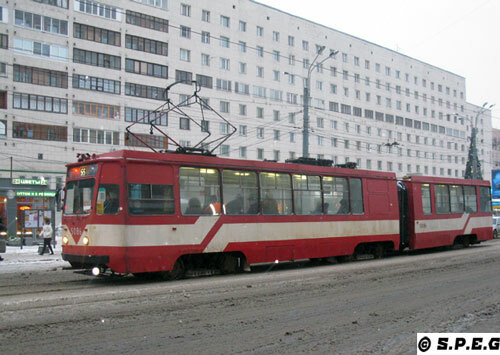 Because this Russian city once had more trams than any other city in the world! There is also a museum (Museum of Electrical Transport) dedicated to them, which offers an interesting exhibition of historic trams and trolleybuses. So, even though a ride in one of these old trams isn't advisable or a must, it could be an alternative way of experiencing something different while you're in the city. However, as nearly all trams run slowly and there aren't many routes outside of the city center, you should consider travelling by tramway only if you aren't in a rush, and you are staying not too far from the thoroughfare of Nevsky Prospekt (city center). Honestly, only a few tram lines are renovated and really convenient for hotels and tourist sites. Otherwise, trams in St Petersburg are the slowest way to go, particularly those in the outskirts. Also, keep in mind that taking a tram on your own can be confusing if you don't speak the Russian language. Still thinking of getting around St Petersburg by tram? If so, to get started just click on a topic below to fast-track to that section. If you really want to have a ride on one of these trams, then two lines worth trying are the №14, which runs from the Mariinsky Theatre up through downtown area and across the large Neva River, and the №1, which runs through Vasilyevsky Island, including a stop just outside the Vasileostrovskaya metro station. Trams in the central part of the city. Remember that most of the trams in St Petersburg are out-of-date, slow and affected by the traffic. Also, once on board, don't expect any comfort, but rather be ready to stand as the capacity of seats are limited. Usually all the trams run between 6 am until midnight on weekdays. The tram stops are marked with signs above the tracks (with a letter "T" on them). The routes are indicated on window placards positioned on the side of each tram. Wondering where to buy your tram ticket? 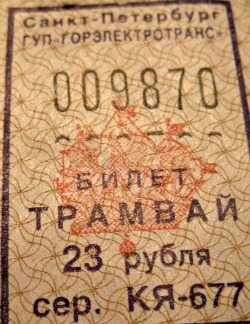 The only place where you can buy your tram ticket is on board the tramway. All trams have conductors on board that check whether everybody has paid and also sell tickets to those who need them. So, when you will get onto the tram you should pay 40 rubles (€0.60/US$0.70), one way, unless you have a monthly pass or a guest card. Very rarely, you might see an inspector (kontrolyor) who won't ask you to show your ticket. Remember also that people working on board the trams usually don't speak any other language apart from Russian. Also, make sure you have a bunch of coins or small notes to buy your ticket. The conductor will not be able to give you change if you pay with big notes. What do you know about trams in St Petersburg? 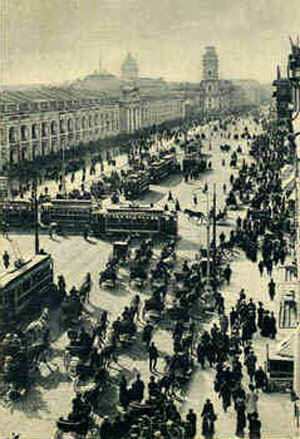 Nevsky Prospekt back in the 1900s. Well, the history of St Petersburg trams, take us back to the late 1880s when the engineer F. Pirockij tested the first electric tramcar in Russia. The first electric tram-line in St Petersburg was put to use only in the winter of 1895 on the ice of the frozen Neva river from the Palace Embankment, near the famous Winter Palace, today's Hermitage. Since then, the city of St Petersburg gradually started to boast the largest tram network in the world, consisting of about 340 kilometers of unduplicated track in the late 1980s. Unfortunately, the scenario at present looks very different. Since 1995, the Russian tram system in Saint Petersburg (like in many Russian cities) has declined sharply in size as major portions of track were removed, particularly in the central part of the city. Most of the trams were replaced with buses and minibuses (marshrutka). At the time of writing, we can say that today only 38 tramway routes operate in the Northern Russian Capital, 34 of which do so on a daily basis; the others operate on working days only. About one third of the tracks operate on a regular basis with frequencies of 10-15 minutes. Other sections operate with frequencies of up to 30 minutes. Despite all these changes, trams in St Petersburg are still very important and used by many Russian people on a daily basis. In case you want to know more about them, you should definitely visit the St Petersburg Museum of Electrical Transport dedicated to the tramway and the trolleybus of the city. It is located in the Tramway park №2 on Vasilievsky Island. 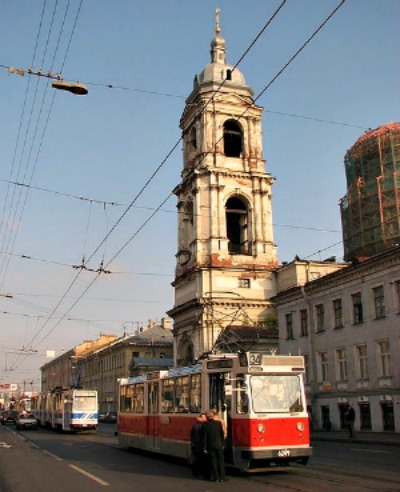 The best way to see some of the main tourist sites and enjoy a fairy-tale scenic view of the imperial city by tram would be to catch the trams №14 and №1 near the main road Nevsky Prospekt. Trams runs from 6 am to midnight on a daily basis. Keep in mind that as with the buses when you take a tram in Russia on your own it can be confusing and/or difficult if you don't speak the Russian language. So we recommend that you go with a local friend or tour guide. If you decide to enjoy a ride by tram make sure you pay the conductor in small notes or coins only. A fine applies if you refuse to pay! From Trams in St Petersburg return to Travel in St Petersburg or go to the Homepage.